Fox News contributor Charles Krauthammer misleadingly claimed that the Congressional Budget Office (CBO) is projecting that the Affordable Care Act (ACA) won't reduce the uninsured population. In fact, the CBO's projections show that the ACA cuts the number of uninsured nearly in half by 2017. The CBO released its 10-year Budget and Economic Outlook report on February 4. Conservative media rushed to distort the report's findings of the effects of the ACA on the labor market. KRAUTHAMMER: [Y]ou get this crazy paradox where the CBO, the Congressional Budget Office, has projected that the number of uninsured Americans in 10 years will be 31 million. When Obama launched Obamacare in 2009, he explained the moral imperative was because there were 30 million uninsured Americans. So here we're going to go through a complete revolution of one-sixth of the U.S. economy, the dislocation of doctors, hospitals, patients, and plans everywhere, including insurers, in order to achieve a result in a decade where we have essentially the same number of uninsured. So what was this all about? 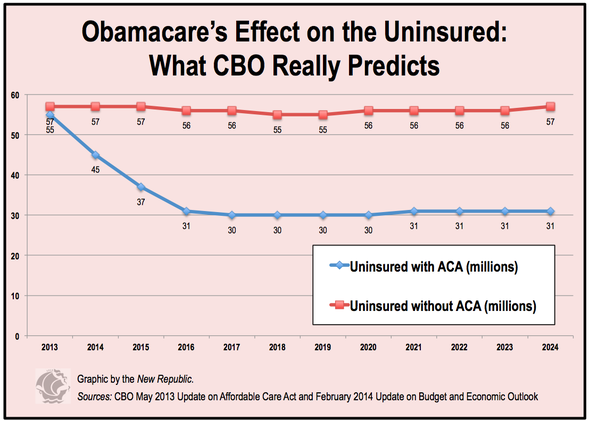 [C]onservatives would have you believe CBO thinks the new health law won't put a real dent in the number of uninsured. That's not at all what CBO said. CBO actually starts with a much higher baseline for the number of uninsured -- 57 million non-elderly Americans -- because of the data it uses. (Estimates of the uninsured vary a lot depending on which survey you choose and how you define the term.) And the Affordable Care Act, according to CBO, will reduce that number significantly. Without the law, CBO says, the number of uninsured Americans would stay at roughly 57 million. But thanks to the various coverage expansions -- not just the creation of new private insurance marketplaces, but also the expansion of Medicaid and ability of young adults to stay on their parents' plans--the number of uninsured will decline markedly. By 2017, according to CBO, Obamacare will have reduced the number of Americans without insurance by nearly half -- or more, if you don't count undocumented workers.